Each ear is made up of three parts. There is the outer ear which you can see, and which gathers the sound. Further in, the outer ear joins the middle ear on each side of the head which contains the ear drum. Deeper still, there is an inner ear on each side. The sound goes down the ear tube, which is part of the outer ear, into the middle ear on that side. 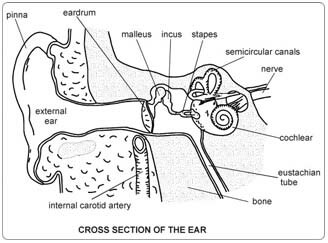 The ear drum stretches across the deepest part of the ear tube between the outer ear and the middle ear and vibrates. The drum is about a third of an inch (8mm¬) across. It is made of thin skin, like the top of a real drum. The middle ear is an air space which connects with the back of your nose. This is why your ear drums pop when you blow your nose. The surgeon has looked into your outer ear and at your ear drum with a special telescope. He can see some fluid behind the ear drum. The fluid has built up in the middle ear. To start with, the fluid was thin and watery. Gradually, it has become thick and sticky, like jelly. It is sometimes called “glue ear”. This fluid stops the ear drum letting the sound through properly. It is the cause of your hearing difficulties. The fluid behind the ear drum may also lead to infection in the middle ear. You will have a general anaesthetic and will be completely asleep. The surgeon will shine a very fine microscope into your ear. He will make a tiny cut in the ear drum (a myringotomy). A very fine sucker will be placed through the hole in the eardrum into the middle ear. The sucker will be used to draw the fluid from behind the ear drum like a miniature vacuum cleaner. This may be all that is needed at this stage. This operation is “diagnostic”, meaning, finding out what is wrong. Some of the fluid that is sucked out will be examined in the laboratory to see if it contains any bugs that need to be treated with antibiotics. If the fluid is very thick, the surgeon plugs a tiny hollow plastic tube into the hole in the ear drum. This tube is called a grommet. It is shaped like a cotton reel with flanges that hold it in place in the ear drum. The grommet lets air pass from the ear tube through the ear drum and into the middle ear. Any fluid in the middle ear will now just dry up. Because you will be asleep, you will not feel any pain during the operation. Your operation can be done as a day case. This means that you come into hospital on the day of your operation, and go home the same day. Both sides can be done at the same time if needed. If you leave things as they are, the fluid will probably not drain away. Your hearing problems will continue. You may get serious middle ear infections. This can eventually lead to more and more thickening of the ear drum as well as thickening of the fluid in the middle ear and can cause irreversible hearing loss. Tablets, medicines, nose drops, and inhalers, will no longer help. Hearing aids will help your hearing but will not get rid of the fluid. You do not need to have your tonsils or adenoids taken out. The best way forward for you, is to have the planned operation. Stop smoking and get your weight down if you are overweight. (See Healthy Living). If you know that you have problems with your blood pressure, your heart, or your lungs, ask your family doctor to check that these are under control. Check the hospital’s advice about taking the Pill or hormone replacement therapy (HRT). Check you have a relative or friend who can come with you to the hospital and take you home. Sort out any tablets, medicines, inhalers that you are using. Keep them in their original boxes and packets. Bring them to the hospital with you. On the ward, you may be checked for past illnesses and may have special tests to make sure that you are well prepared and that you can have the operation as safely as possible. Please tell the doctors and nurses of any allergies to tablets, medicines or dressings. You will have the operation explained to you and will be asked to fill in an operation consent form. Many hospitals now run special preadmission clinics, where you visit for an hour or two, a few weeks or so before the operation for these checks. If you have a cold in the week before your admission to hospital, please telephone the ward and let the ward sister know. The operation is usually put off, and you are given time to get better before being sent for again. You will have to get over the cold before the operation can be done because by having an anaesthetic the cold could turn into a serious infection in the chest. There is very often no pain in the ear after simple removal of the fluid or insertion of a grommet. After three to four hours on the ward you will be well enough to go home. A general anaesthetic may make you slow, clumsy and forgetful for about 24 hours. The nurses will help you with everything you need until you can do things for yourself. Do not make important decisions, drive a car, use machinery, or even boil a kettle during that time. You will be given arrangements about a visit to the ENT (ear, nose, and throat) outpatient clinic for the doctors to check the grommets and your hearing. The nurses will advise about sick notes, certificates etc. Take two painkiller tablets every six hours to control any earache or discomfort. If the fluid has not built up again after the simple drainage, you should be able to hear normally. If the fluid comes back, you may need a grommet. With a grommet in place, the fluid will clear quickly from behind the ear drum. The grommet stays in the ear drum for about a year. As the fluid problem gets better, the hole in the drum heals, and squeezes the grommet out into the ear tube. The grommet then usually sticks to wax in the ear tube. The doctor in the out patient clinic will easily be able to take it out. Sometimes the grommet has to be taken out with a small operation, if it does not come out by itself. Keep the ears dry. Do not allow water to enter the ears when you are taking a bath or washing your hair. Protect the ear by placing a piece of cotton wool rubbed in Vaseline in the ear. It is better not to go swimming while the grommet is in place. If you want to swim use the cotton wool ear plug and a swimming cap. You must not have your ear syringed if you have a grommet. It is perfectly safe to travel by air. If you follow the advice listed above, problems are unlikely. Occasionally people notice a popping or clicking in the ears. This is not harmful, it is expected and you should not worry about it. You may notice some clear but lightly blood-stained fluid coming out of the ear for the first two days after the operation. This is expected but if it continues for more than two days and you get a runny ear (especially if the fluid coming out is thick, yellow and/or green or smelly), it most probably means that you have got an ear infection. You should go to your doctor who will probably give antibiotics to help clear the infection. If the infection is not getting better, he will arrange for you to be seen in the ENT outpatient clinic. In a few patients, the ear can be a bit runny without anything serious being wrong. In addition, if you don’t have a runny ear but you get a headache, a temperature or you become irritable, you should also be alert and ask for medical advice because these symptoms can be an indication of a developing infection. When the grommet comes out, there will be a tiny scar left on the ear drum. This is not anything to worry about. It will not make any difference to your hearing. In a small number of people (2 to 3% of cases), the small hole in the eardrum does not seal up quickly when the grommet comes out and may need to be closed with another operation.